SCVHistory.com | San Francisquito Canyon | St. Francis Dam: One Family's Ordeal. St. Francis Dam: One Family's Ordeal. The gates of hell opened onto a sleeping Saugus population. By David Desmond, Gazette Correspondent. Old Town Newhall Gazette, July-August 2006. 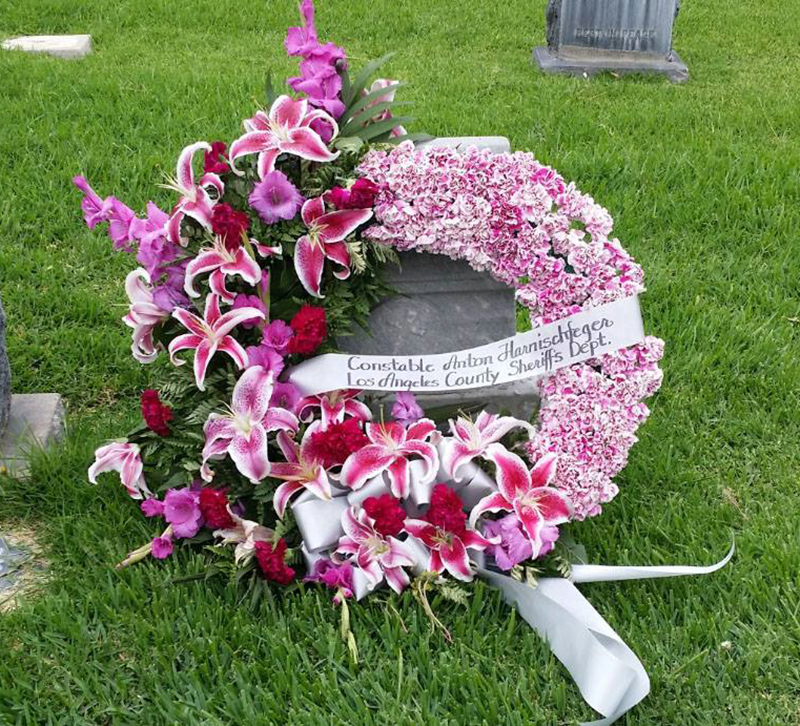 Click here to read about Tony's father, Anton Harnischfeger, an L.A. County constable who was killed in the line of duty in 1889. 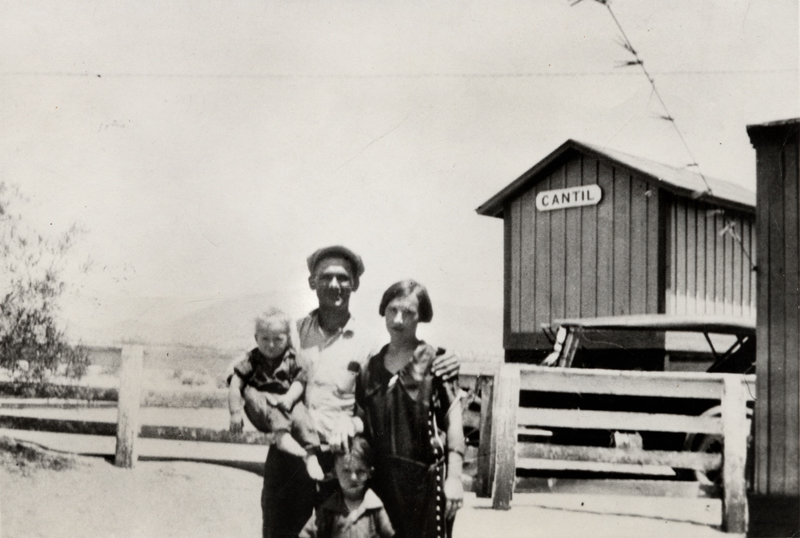 CANTIL — Back some 85 years ago, a family in Cantil, a small community in the northern Antelope Valley, was celebrating a union. On November 26, 1920, Mr. and Mrs. Cody Miller witnessed the marriage of their daughter, Gladys. 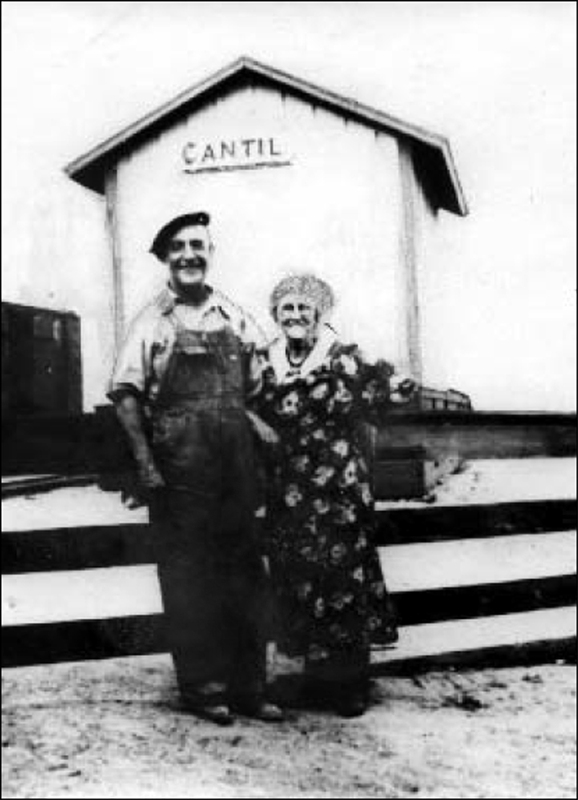 Cody Miller was the station agent at the Southern Pacific Railroad's Cantil station. His wife, Minnie, kept house. Seventeen-year-old Gladys was marrying Tony Harnischfeger, a thirty-three-year-old native of New York and a worker for the Los Angeles Department of Water and Power. In the following years, Tony and Gladys would have two children, Coder, born in 1921, and Gladys Antoinette, born in 1924. It must have been quite an honor for Cody Miller to hear that they named the boy Coder, a probable derivation of his grandfather's name. The good times for Tony and Gladys didn't last. At some point in late 1926 or 1927 the marriage dissolved. Tony took a transfer to a new dam constructed in Saugus — the St. Francis. He left with his oldest child, Coder. Gladys and her young daughter, Gladys Antoinette, stayed in Cantil with her parents. Damkeeper Tony Harnischfeger with wife Gladys, daughter Gladys Antoinette (left) and son Coder at the depot in Cantil, just south of today's Red Rock State Park in Kern County. While Tony Harnischfeger and son Coder were in Saugus, Tony took up residence with a woman named Leona Johnson. Tony's wife, Gladys, promptly secured an interlocutory decree of divorce. It was during this time in early 1928 that Tony Harnischfeger, the damkeeper, began telling people that something was seriously wrong with the St. Francis Dam. Several books and interviews regarding the dam suggest Tony warned many people that the dam might fail, including its architect, William Mulholland. Tony's cottage sat directly below the dam. He had steps built up a hillside near the cottage in the event of the unthinkable. On the evening of March 12, 1928, at close to midnight, the dam collapsed and the gates of hell were opened to a sleeping downstream population. Tony Harnischfeger, his son Coder and Leona Johnson were the first of approximately five hundred people to die that evening. The water and debris followed the Santa Clara riverbed all the way to Ventura. In the years that followed, the legend of Tony Harnischfeger would play a role in the official inquiries and news reports. Tony and Coder's bodies were never found. The body of Leona Johnson, Tony's girlfriend, was the only one of the trio recovered. Mulholland, the self-trained engineer who brought water to Los Angeles via the Los Angeles Aqueduct, accepted full responsibility for the failure of the St. Francis Dam. He retired in that same year and died a broken man in 1935. The human side of the disaster took a huge toll on the family of Cody and Minnie Miller. The Mojave Record of March 23, 1928, reported that "all of the people of the Cantil community extend heartfelt sympathy to Mr. & Mrs. Cody Miller and daughter Gladys in their great loss in the St. Francis Dam disaster." Another heartbreaking entry was noted in the Randsburg Times on April 6, 1928: "Cody Miller returned to Cantil Saturday after a fruitless search for the body of his little grandson who was lost in the San Francisquito Dam disaster." Minnie Miller and her daughter Gladys spent a lot of time together in the aftermath of the disaster. One newspaper article noted that the two traveled to Bakersfield to collect insurance money for Tony's surviving child, Gladys Antoinette. The newspaper also mentioned that Minnie Miller had become seriously ill.
Cody and Minnie Miller, seen here in happier times, about 1922, lost their little grandson in the 1928 flood that decimated San Francisquito Canyon. Click image to enlarge. It is unclear whether the Miller family received any money from the death of their grandchild (Gladys' son) from the city of Los Angeles. According to accounts in "Man-Made Disaster: The Story of St. Francis Dam" by the late Charles Outland, the city of Los Angeles' legal team was formidable. A small article in the Mojave Record of September 4, 1929, tells an interesting story. "Mrs. Cody Miller and daughter Gladys and party of friends were here (Mojave) last weekend. While here, Mrs. Miller received the news of the death of her only brother, George Moom Popham of Chicago. Mr. Popham was a district attorney for eight years and later was of the firm of Dearrow (sic), Popham and Sissman. Mrs. Miller had planned a visit next month. We all extend our deepest sympathy to Mrs. Miller." The law firm mentioned in the story was misspelled. In fact, it was the law firm of Clarence Darrow, considered by many legal scholars to be the greatest trial lawyer of the 20th Century. A question in the legend of Tony Harnischfeger arose. Minnie Miller's grandson was killed as a result of a civil engineering failure. The builder of the St. Francis Dam — the Los Angeles Department of Water and Power — was considered a bully in press accounts of the time. Minnie's brother, George Popham, was a law partner of the greatest trial lawyer in the United States. Why didn't Clarence Darrow take on the Los Angeles Department of Water and Power? This question was answered upon further research. In his book, "Clarence Darrow For The Defense" by Irving Stone (1941), Stone tells of the "Popham" scandal. George Popham was involved in a scandal in Clarence Darrow's law firm. Darrow hired Popham to handle the firm's criminal work. Popham was still newly hired with the firm when he forged a will for a woman client. Darrow went into court unaware of the forged will. "The scandal broke over the forged will, and Clarence was sick about it." After Darrow returned from court, Popham told another attorney in the firm to testify on his behalf or he would blow his own brains out. This message was conveyed to Darrow, who responded, "You go back and tell Popham that's the best thing he can do, but not to do it in the office; he's made enough mess around here." The year was 1922 and it is assumed George Popham was fired. Minnie Miller, George's sister, would pass away soon after George in 1929. In his last years, Cody Miller was affectionately called the "mayor of Cantil." Bill Pappas, an eighty-year-old Cantil native, remembers Cody. "He used to tell me he lost family in the St. Francis Dam disaster. Cody was a friendly guy. He had a habit of fixing pancakes for anyone who came to see him at the train station." Bill's wife listened intently. "He must have been very lonely," she said. Bill Pappas believes Cody Miller died in the late 1930s. Don Ray, a journalist for the Los Angeles Daily Journal, is a historian who has spent more than twenty-five years researching the St. Francis Dam. According to Ray, Gladys Miller spent the majority of her life as a street evangelist in downtown Los Angeles. Her daughter, Gladys Antoinette, also known as Little Toni, died in 1969. Gladys Miller died two years later in 1971. The majority of their life in Los Angeles was spent in poverty. The tragedy of the Miller family and Tony Harnischfeger underscores the suffering from both a man-made disaster and a broken family. The definitive book on the St. Francis Dam is Outland's "Man-Made Disaster." It is available from the Arthur H. Clark Company, P.O. Box 14707, Spokane, Washington, 99214. The Internet has some great photos and text on the disaster. Look up "St. Francis Dam" at scvhistory.com for more information. This story originally appeared in the August 25, 2005, edition of Mojave Desert News and is reprinted by permission.